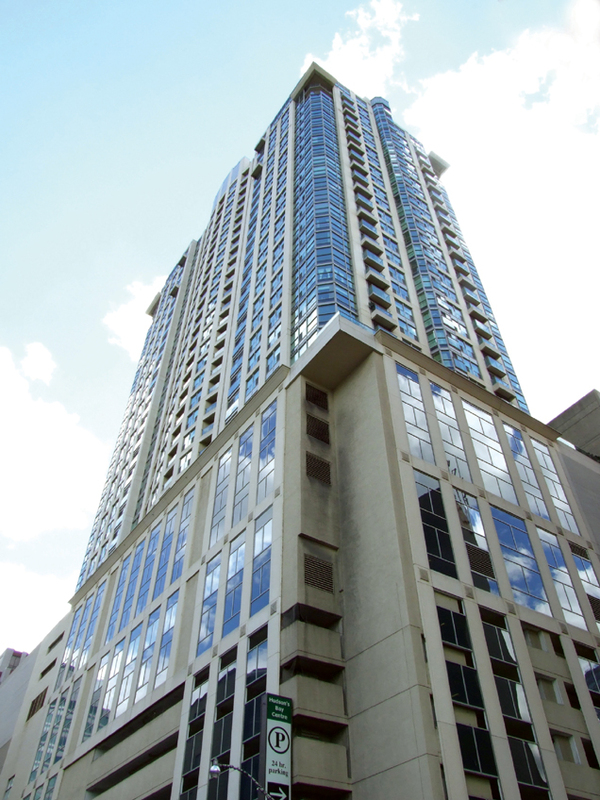 This twenty-three level residential condominium, plus three levels of superstructure parking, is located north of Bloor Street, east of the Yonge Street subway, at 8 Park Road. It was constructed between 1999 and 2001, on top of a two level health club, over four levels of superstructure parking, three levels of mercantile space, and three basement levels, at the existing Hudson’s Bay Centre, which was built in 1973. Before transfer framing could be introduced into the lower level, of the health club, and a three elevator shaft, and additional walls, could be built, in the upper level of the health club, extensive strengthening had to be completed to many of the walls and columns in the existing levels below, as well as to a select number of footings, below the third basement level. Above the health club, three levels of parking, P8, P9 and P10 were added for the condominium residences. The three levels were similar 230 mm thick reinforced concrete flat slabs, with 150 mm deep drop panels, over the columns. Concrete was typically to be of a 30 megapascals strength, at twenty-eight days, but those portions of the slabs, exposed to deicing chemicals, were to be of a 35 megapascals strength, and to satisfy exposure class “C1” criteria. The lower roof level, above the new parking levels, serves, in part, as a landscaped terrace, and to accommodate mechanical rooms. This slab is generally a 230 mm thick, reinforced concrete flat slab, with 200 mm deep drop panels, and two-way reinforced slabs. The residential floors, from the second level up to the twenty-second level, are typically 200 mm thick flat plates, supported on reinforced concrete shear walls, and columns with 300 mm deep small drops. The interior bays, of the slabs, are two-way reinforced with mild reinforcing steel, however, the bays at the north and south ends of the slabs are reinforced with a combination of mild reinforcing steel, and post-tensioned mono-strand tendons with a 15 mm diameter conforming to ASTM Standard A416, coated with a rust inhibiting grease and encased in seamless extruded plastic sheathing. All of the residential floor slabs, and the similarly reinforced 300 mm thick, roof slab, above, are cast with a semi-light weight concrete, with a specified twenty-eight days strength of 30 megapascals. The concrete, in the walls and columns, from the transfer level up to the second residential level was specified to have a strength of 45 megapascals, at twenty-eight days, and to be reduced in 5 megapascal increments down to twenty-five megapascals, above the thirteenth slab level. Lateral forces, resulting from wind and seismic effects are resisted by the shear walls, the walls of the two stairwells, and the three elevator shaft walls.